Today marks the 100th anniversary of the commencement of the Great War. The following article is published with the kind permission of the Hibernian Historical Trust. At the outbreak of war with Germany in August 1914 there was resentment in some quarters that unlike cricket and rugby who had immediately cancelled their sporting programme, professional football continued almost as normal. At that time Britain alone of the major powers did not have a policy of compulsory conscription, relying instead on its pre war army, the territorial’s and the duty minded, but by the first Christmas of the war over a million new recruits had already joined up. As the casualty figures increased on the Western front however, there was growing anger that the game was still taking place. Many were of the opinion that this was hindering the recruitment of new recruits, and it was not unusual for fit and healthy young men, footballers or not, from being approached in the street by young women and handed a white feather as a sign of cowardice. It has been suggested that it was this animosity that football was still going ahead while young men were dying in France that led to many of the players of Heart of Midlothian and Queens Park volunteering their services in the armed forces almost en bloc. 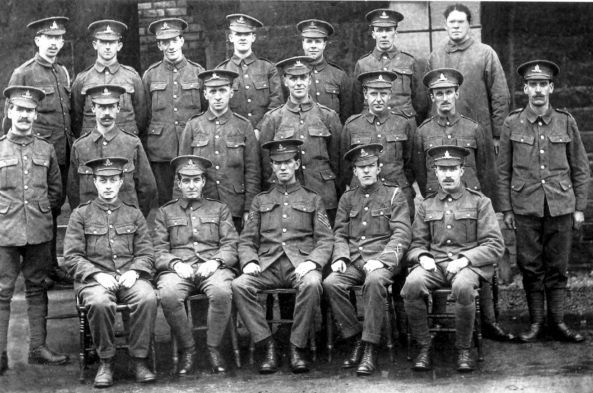 Most of the Hearts players joined the 16th Royal Scots, what would become known as the McCrae’s Battalion, a force raised predominately in the west of the city. The actions of the Tynecastle players was highly commendable, particularly the ultimate and tragic sacrifice made by several of the side. Not so well documented however, is the part played by Hibernian during the conflict. Within days many Hibs supporters had joined the McCrae’s Battalion including the future Easter Road chairman Harry Swan. Unfortunately Swan would later be discharged on medical grounds. Hibs player Sandy Grosert had also enlisted in the battalion. A territorial regiment, the 7th Royal Scots had already been raised in Leith, and keen to play its part, at the outbreak of hostilities Hibs immediately made both Easter Road and the ground at Piershill available to the military authorities for the training of new recruits. In common with most, if not all the other Scottish clubs, particularly Hearts, Aberdeen, Falkirk, Raith Rovers and Queens Park, during the four years of the horrendous conflict, many Hibs players would see service in uniform, several enlisting before compulsory conscription was introduced in 1916. At the beginning of the war the Easter Road side comprised of only a very small squad of players, but within weeks at least seven were either in the armed forces or in a war related occupation. Another, centre forward James Hendren, a prolific goalscorer who had been signed from Cowdenbeath in 1911, had registered as a driver in the Army Transport Corps, but as his wife had just given birth he was allowed to delay his enlistment. Sadly, within a few months Hendren would die of natural causes in the Edinburgh Royal Infirmary. Hibs players David Stevenson, James Williamson and Robert Reid had played only a few games at the start of the 1914-15 season before they too decided to join up, as did the Chicago born outside right Robert Wilson, who had played in the previous seasons Scottish Cup Final. Sadly, Wilson was killed in November 1918, just a few weeks before the end of the war. Another, John Aitken, a pre war signing from Perth Violet would play several games for the club during the 1914-15 season before enlisting in the Gordon Highlanders. He was killed at Ypres on 13 July 1917 and is buried at Vlamertinghe New Military Cemetery in Belgium. Sergeant Patrick ‘Paddy’ Hagan, a popular player with Hibs during the early years of the century, was killed at the battle of the Somme in July 1916 while serving with the 11th Battalion Royal Scots. Aged almost 37 Hagan, who resided in Nicolson Street in the city, had also seen service in the Boer War. Like so many thousands of others, he has no known grave, and is commemorated on the Thiepval Memorial in France. Another, Robert Rollo who joined the club from Clydebank Juniors and played during the 1907-08 season is believed to have been killed on 30 April 1917. Leith born Sandy Grosert, a pre war signing from Leith Amateurs and a registered Hibs player throughout the entire campaign had enlisted in the McCrae’s Battalion just weeks after the start but had transferred to the Machine Gun Corps in 1915. Second Lieutenant Grosert, another who played in the Scottish Cup Final against Celtic in 1914, would be awarded the Military Cross for conspicuous gallantry in the face of the enemy at the battles for Rouex and Greenland Hill in 1918. Although severely gassed and wounded, Grosert would return to Easter Road after the war, ending his playing career with Dunfermline in 1924 after a short period at Aberdeen. The former St Bernard’s player John Sharp, who had played for the club at the turn of the decade, would also win the Military Cross for conspicuous gallantry. Commissioned from the ranks after enlisting in the Argyle and Sutherland Highlanders at the outbreak of war, T/Lt. Sharp’s citation in the Edinburgh Gazette on September 18th 1918 reads: ‘for conspicuous gallantry and devotion to duty throughout the week’s operations, especially in rallying and organising his men during withdrawals under heavy fire. On one occasion he led a bombing party back to a trench occupied by the enemy, keeping them back until his company had reorganised in a new position. Another time he pushed forward with a Lewis gun section to meet an attack which was beaten off. Until wounded he inspired all his men by his example. Sec Lt. George Rae, of the Royal Warwicks, who had been a registered Hibs player from the turn of the decade until enlisting just weeks before the outbreak of war, would later be awarded the Italian silver medal of honour. Robert ‘Bobby’ Atherton was another former Easter Road player to make the supreme sacrifice. Atherton, capped by Wales in 1899 and 1903, had captained the great Hibs side that won the Scottish Cup in 1902 and the League Championship the following season. While serving as a steward aboard the Leith registered ‘Britannia’ he was lost in the North Sea in October 1917, when his ship went down with all hands after either hitting a mine or sunk by submarine action. He is commemorated on the Merchant Seamen’s memorial in London. As at most football grounds collections to aid war related charities had been a regular feature before games at Easter Road, as were the frequent appeals for new recruits both inside and outside the ground. Along with neighbours Hearts, Hibs would also take part in several games to raise funds for war related charities such as the Belgian War Relief Fund, and the Army and Navy Benevolent Fund. In November 1918 the war to end all wars finally came to an end, leaving hundreds of thousands of Britain’s dead scattered over battlefields throughout the world. On 21st September 1921, a combined Hibernian/Hearts XI faced a Rangers/Celtic select at Tynecastle to raise funds for the construction of a memorial to the Hearts players at Haymarket. Later, at the unveiling in 1922, a wreath was laid by the Easter Road club, all the players and staff present at the ceremony. Today, each Armistice Sunday, a representative from Hibernian still lays a wreath at the Memorial. In 2004 and 2014, a group of Hearts supporters were instrumental in raising a memorial to the dead of the 16th Battalion of the Royal Scots at Contalmaison on the Somme. The French village was the target for the Edinburgh and Lothian’s regiment on the first day of the battle in July 1916, a target sadly, that was not reached on the day, hundreds dying in the attempt. The cairn pays tribute to the players and supporters of Heart of Midlothian who fell at the Somme and also others from Hibernian, Falkirk and Raith Rovers. At a ceremony held on the anniversary of the first day of the battle each year, a wreath is laid at the memorial by a representative of Hibernian Football Club. As a species, the human race is often tribal, many of us taking great pride in supporting our own particular side, but perhaps what matters most when facing the enemy, is not what particular football team takes your fancy, but whether or not the man beside you is reliable. Pictured: Hibs long serving captain, Matt Paterson, 2nd from left, back row, serving with the Royal Artillery. Regards the article about Hibs players killed during The First World War, you stated that The War began 100 years ago today. Today is The Centenary of the first day of The Battle of The Somme. Thought I would let you know. Hello and thank you for reading – the article was published on the anniversary of the start of World War I on 4 August 2014 so the sentence is correct – although you are also correct in saying that today marks 100 years since the Battle of the Somme.